Today is a multi-topic post. First off, I disappeared for 24 hours to Half Moon Bay for a wee vacation over a three-day weekend thanks to our national independence. The three of us headed for a small hotel in Montara for the night and out to a nice dinner on Saturday. Sunday we sat at the beach and watched Chloe exert enough energy for the three of us as she chased sticks, played in the waves and cavorted with every dog that passed by. Here’s a picture about an hour before sunset from the restaurant on Saturday. Sunday we had an excellent breakfast at a cafe right next to the local airport, the Three-Zero Cafe. It took us a really long time to order as everything looked and smelled delicious. We vowed to come back soon so we could try some of the other dishes. I settled on a combination of pancakes with some eggs and lots of coffee! 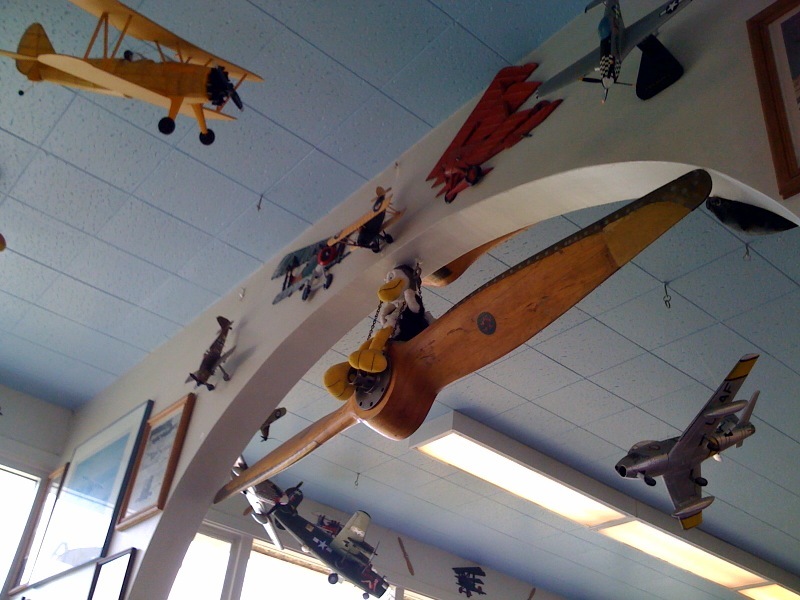 Being next to the airport the cafe was filled with lots of plane memoribilia………. This last week included 42 miles of training. One day this week, Wednesday, was a 6 mile time trial which I repeat once a month. It was an exciting week as my 9 mile Monday was relatively easy (and beautiful), and Wed. I beat my previous TT time by 8 min. I was feeling really good about my progress and performance. I was a little anxious about Saturday’s distance because I was unable to complete 25 miles the Saturday before. However, I approached Sat.’s distance like that of the first leg of the race where the first checkpoint is about 25 miles. Mentally I was telling myself I just had to complete 25 miles. The day was looking good as there wasn’t a speck of wind and the water was almost completely flat in the estuary. 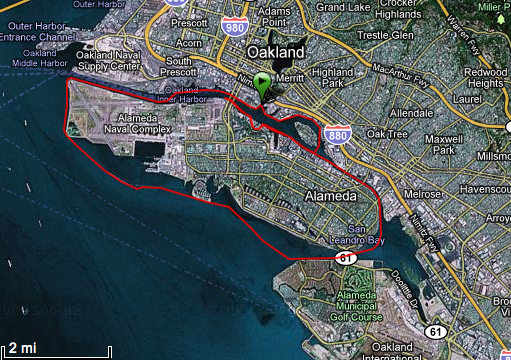 I planned to go north 4 miles and then retreat 8 miles covering the eastern side of Alameda Island. Then depending on the tide round the southern tip continue on for awhile and see how far I could get. I wanted to do about 12 miles before I again turned around and headed in the direction of my starting point. Well it was dead flat when I got to the northern tip of the island (the first 4 miles) and I figured this would be the time to try to circumnavigate it. I went for it and I did paddle the entire way. Unfortuneately at about 13 miles I started to get horrible muscle aches in my torso. I immediately took some ibuprofin and hoped it would make enough of a difference that it wouldn’t interfere with the distance I’d hoped to accomplish. I kept my mind focused on passing my starting point and doing as much mileage back up the channel before turning around again. Mentally, I didn’t think I could pass the starting point yet again for the third time without heading for the dock and finishing my day. I seemed to lose my focus at about 16 miles. I was entering a really busy part of the channel and decided to turn back (south again) and head for Coast Guard Island. I passed my starting point for the third time and as I paddled past the west side of the island (Coast Guard Island) I knew all I had left was getting around that island and heading for home. I didn’t think it would be more than 20 miles or so, and it was just shy of 21 when I finished. I was completely spent, and as I sat in my cockpit a bit trying to feel good about what I had accomplished all I had were doubts about ever being able to paddle 25 miles. I know I’d done a lot. Twenty-one miles is something to feel good about, right, but all I could think about was if I can’t even complete 25 miles in training how was I really going to be ready for 100! I continued with my doubts the rest of the day. Should I just give up now? I was supposed to do 30 miles next Sat. with my coach. Was I going to embarrass myself next weekend? Maybe I was just too old for this? Maybe I wasn’t good enough for this? I felt distressed about the fact I was doing all the training and my body wasn’t cooperating with the plan. The first friend I talked to suggested maybe I was training too hard. Maybe I needed a break; some time off. My first reaction was, “no, I have a scheduled training regimen. I need to stick to it.” The next friend I talked to said 21 miles wasn’t that far from 25, and I’d gotten around Alameda Island, something I’d been trying to do for a month. She seemed totally convinced I would find answers to my apparent dilemma. Well, I didn’t have too much time to sulk as I was leaving for my Half Moon Bay adventure. I’d have to put a hold on my obsessing. Twenty-four hours later and I was feeling a little better about my Sat. paddle. I was recognizing that yes, 21 was really close to 25. Also I was willing to try something different. I’ve decided to take the whole week off and only paddle the 30 miles this upcoming Sat. on the Sacramento river. It feels like a risk not to do the mileage planned for the week. But it feels right about taking a break and seeing what I can do Sat. with more rest. I’m also wondering if I’d taken in enough calories. I’ve been using a liquid endurance formula for athletes. It’s possible I need a higher dosage of calories. So, next paddle, I’ll increase the calorie content of my drink. I realized later I didn’t take my supplements regularly (electrolytes) and I also missed some doses. I think my physical discomfort interfered with my focus on taking water, supplements, and calories on the planned intervals. It’s a week off for me. I’ll keep you posted. This entry was posted on July 5, 2010 by DummyDiva. 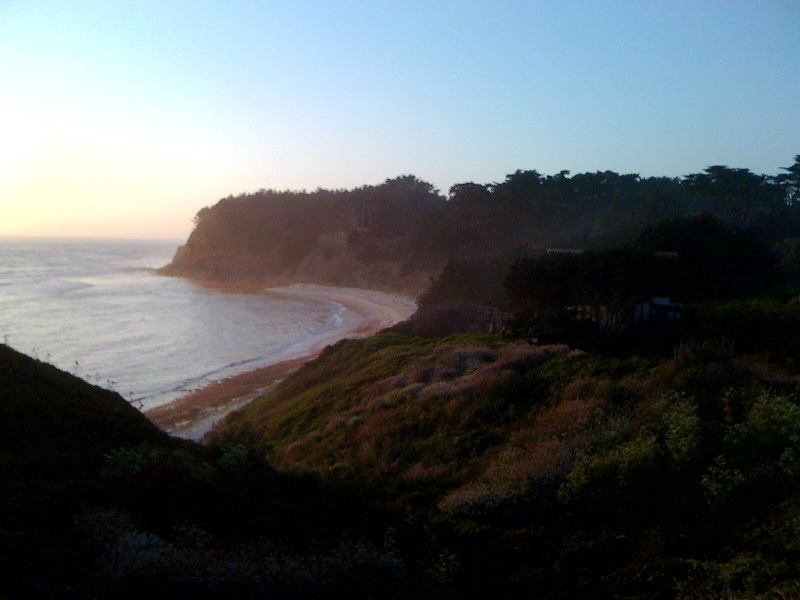 It was filed under Uncategorized and was tagged with Alameda Island, Half Moon Bay, kayaking, Moss Beach, training.